The parents and brother of a Palestinian toddler burned to death by suspected Israeli settlers were fighting for their lives on Saturday, as protests over the arson attack entered a second day. The firebombing of the family's home in the occupied West Bank, which killed 18-month-old Ali Saad Dawabsha, sparked an international outcry over Israel's failure to get to grips with violence by the settlers. His father Saad was being treated for third-degree burns at the Soroka hospital in southern Israel, where a spokeswoman described his condition as "critical". Mother Riham and four-year-old brother Ahmed were being treated at Tel Hashomer hospital near Tel Aviv, where a spokeswoman described their condition as life-threatening. The family's small brick and cement home in the village of Duma was gutted by fire, and the words "revenge" and "long live the Messiah" were spray painted on a wall. Palestinian protesters took to the streets across the West Bank, including Israeli-annexed east Jerusalem, triggering clashes with the Israeli occupation army. 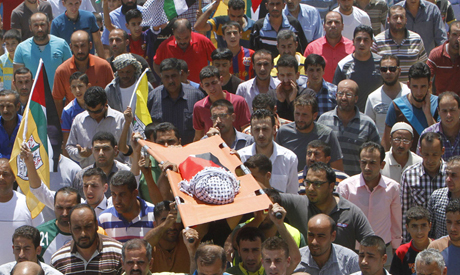 North of Ramallah, Israeli troops shot Laith Khaldi, 17. He was pronounced dead early on Saturday. On Saturday morning, Palestinians and Israeli settlers clashed near Kusra in the northern West Bank, trading volleys of stones until the Israeli army declared the area a closed military zone. In east Jerusalem, some 10 Palestinians were wounded in overnight clashes with Israeli police, Palestinian sources said. Israeli Prime Minister Benjamin Netanyahu has condemned the attack on the Dawabsha family as "terrorism in every respect" and vowed to spare no effort in bringing the perpetrators to justice. But Palestinian president Mahmud Abbas said he doubted Israel would provide "true justice" and ordered his foreign minister to file a complaint at the International Criminal Court in The Hague. why Egypt court made decision AGAINST HAMAS?